Some people are born travelers; others are made. Most of me fits the first category, but my stomach goes along reluctantly. My very first recollections of travel are gastro-intestinal. For many of my youthful Summers my parents, and aunt and uncle used to take my brother and me on a long drive up to a lake in the Adirondacks. I loved those two weeks, swimming, fishing and skipping rocks on the placid water after dinner with my brother. But I didn’t much like getting there, which involved several hours of queasiness and heaves in the car. As a kid I had such a a case of motion sickness I could get “mal de sidewalk” just sauntering down the street and turning my head to one side too quickly. I suspect my buddies used to keep a little distance for fear I’d throw up on them. So when we went on our Summer trip to the lake my mother would make a comfy little space in the back seat of the car, with pillows for me to rest my pukey little head. She had crackers handy; they were bland and were not too offensive in a regurgitated form. But there was always a bucket within reach. Getting there was definitely, for me, a good bit less than “half the fun”. Somehow it my stomach did not deter me from wanting to visit faraway places and peoples. Over the years I’ve forced my stomach onto nearly every mode of gut-churning transportation. Amazingly, though I’ve reached for a white bag a time or two I’ve managed to hold my lunch since those Summer sojourns to the lake. Not without considerable effort however. I nearly lost it on that Hovercraft crossing the Channel back in 1977. We knew it was stormy when we were on the train from Paris to Boulogne. The conductor kept coming by and muttering something like: “Le bateau, il ne mache pas. Il y a un grand orage.” Heck, we weren’t worried, we weren’t booked on a ‘bateau’ . We were on the hovercraft; forty-five minutes soaring inches above the waves in an airliner-like cabin. Beats lurching around on a ferry with drunken lorry drivers for three hours. Well, the notoriously inclement English Channel said, have I got news for you. The Hovercraft lifted itself upon in its rubber skirts and slid aftward off the beach and into the shallows. For the first few hundred metres it looked like it would be a nice smooth trip. Then we hit the huge swells, and rather than gently hover over the surface, the craft rose, then dropped several feet every few seconds, sometimes sliding to one side, then another. It pitched, rolled and yawed, and bashed itself into the larger swells; it did everything but cartwheels. We were well out to sea when one of the “stewardesses” informed us that the storm had put three other hovercraft out of commission that day. Were we riding over them at that very moment? OK, I can handle this, I said to myself—building you confidence up is a big part of keeping your lunch down. I would use the “horizon-fix method”: take a fix on the horizon and lock your eyeballs on it. This keeps one’s brain from getting confused by getting mixed messages from one’s eyes, the main cause of mal de mer . Only one problem, the spray on the windows and the rain and swells outside obliterated the horizon much of the time. I was about to panic when I saw the guy across the aisle and two rows up. It was the most pathetic sight in the annals of motion sickness. He was a large guy in his mid-thirties, and by the time I noticed him he had a white-knuckle grip on the seat in front of him and his shirt was already soaked with sweat. He was staring straight ahead, maybe looking for that elusive horizon, his body jerking with each lurch of the craft. In a few minutes more droplets of perspiration were falling from his soaked head, some droplets would spray off him as a yaw lolled his head from side to side, or a smash into a swell lurched him forward. The stewardess brought some towels, but she had to towel him off since he refused to relinquish his grip. I first formulated my theory that British ladies are immune to mal de mer on that crossing. This was later scientifically confirmed many years later by direct observation one morning when I was doing my “horizon-fix method” on a ship in the Pacific. It was going from Manilla to Hong Kong, passing the Luzon Straight where the Northeast Trades have an unobstructed opportunity to roll up the seas for several thousand miles. 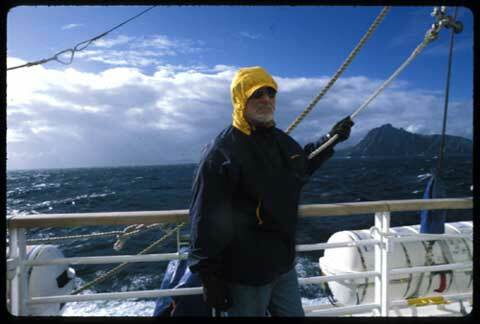 The spray was flying, the wind howling, and the temperature was dropping as I clung to my deck chair on the promenade deck, bundled up and wiping the spray from my glasses so as not to lose my fix on that horizon or lose my breakfast. I had been in that attitude for about an hour, cold, wet, alone on the deck, and in a ferocious battle with my GI tract, when the door a few feet away was flung open and two. . . yup. . .grey-haired, British Ladies burst out onto the pitching deck as sure-footed as a couple of old jack tars. It was the one with the blue flower-print dress and the thin grey cardigan who, rubbing her hands more with delight than for circulation, I overheard to remark to the other as they briskly strolled by: “Ah, isn’t this more like it, at last, this is SAILING!” I would have got up and pushed them over the side if I hadn’t been so afraid to take my eyes off the horizon. When that hovercraft years earlier finally limped into Folkstone after two hours the sick guy was wrapped in blankets, but still holding onto the seat. A few minutes before we arrived I heard a moan from the seat behind me. The young Spanish man dressed in his Sunday best was coming to see his English girlfriend we had overheard from his conversation with the stewardess. There had not been a sound from him for some time, since the moan and the sound of him passing out on the floor. He was ignominiously carried off in one of the fireman’s carries by two deckhands, in between the sick guy still wrapped in blankets, and the British ladies in their flower-print dresses, laughing and chattering like they’d been playing bridge all afternoon. I still believe in the horizon-fix method. But just in case circumstances are such that I can’t see the horizon I always pack a nice flower-print dress. 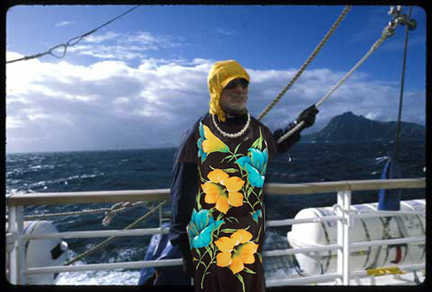 Un-retiouched photo of ancient mariner in lovely British lady flower-print dress to ward off mal de mer. The pearls were a nice nautical touch, dontcha think?